Safe - Non-irritating. Easy to apply and remove. Soap and water clean-up! 1) Remove Scar Skin from container. Knead between fingers to soften it and to mix its ingredients. 2) Gently stretch and flatten out scar skin. Use it all or pull it apart into smaller pieces. 3) Put a flattened piece on your skin and blend in the edges. Use your imagination. Experiment with different size pieces of Scar Skin. Apply wart to nose or chin, press a hole in a wart with toothpick or other safe instrument. Insert a hair or two and press in place. Or apply a long scar to arm or hand, make a groove in it and fill with fake blood. 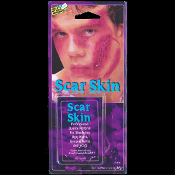 Keep your Scar Skin in its container between uses. *Take care when using. Scar Skin can permanently stain some fabrics and surfaces. *Never use in carpeted areas.